A 47-year-old man was bitten several times by a shark Friday morning while in the surf off Avon on Hatteras Island, and was flown to a Norfolk hospital for treatment. Cyndy Holda, spokesperson for the National Park Service Outer Banks Group, said the incident happened at 11:41 a.m. approximately one mile north of the Avon Pier. “The victim received various injuries to his right leg and lower back,” Holda said in a news release. No other swimmers were injured. The eyewitness said the man had bites on his lower back, buttocks and ankle, and he was very aware of what happened. 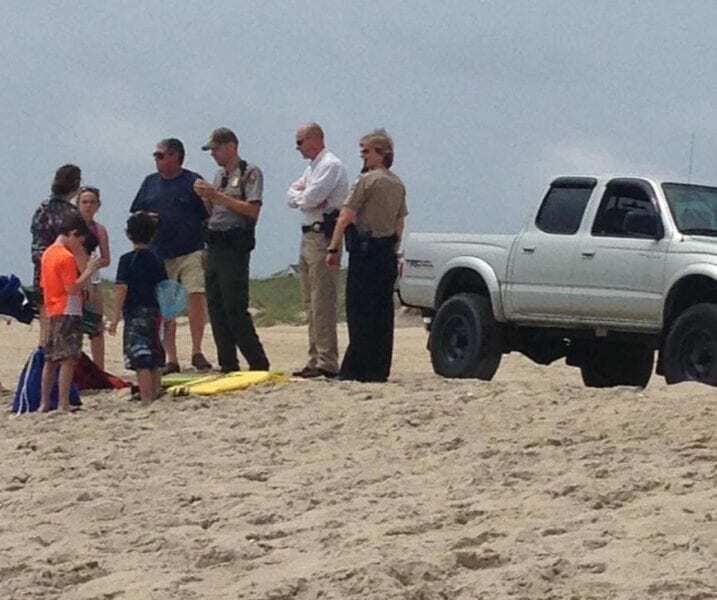 “He got bit so many times trying to get his kids out of the water,” according to the eyewitness. The victim’s family and others started pouring bottled water and putting pressure on the bleeding wounds until paramedics arrived, the eyewitness said. The man was transported by Dare County EMS to the Avon Medical Center, Holda said. DareMedFlight was dispatched to transport the man to Sentara Norfolk General Hospital. The last reported shark incident on the seashore was in 2012 when a woman was bitten on her leg while she was swimming in shallow water near the Avon Pier, according to the Island Free Press. In 2011, a 6-year-old girl was airlifted to Pitt County Memorial Hospital in Greenville after she was bitten by a shark on an Ocracoke beach. That incident happened about 5:30 p.m., also in shallow water. The child was on a boogie board, and the shark was reported to have been about 4 or 5 feet long. Ten years earlier, the last fatal shark-involved incident in North Carolina waters took place near ramp 38 south of Avon. Sergi Zaloukaev, 28, of Arlington, Va. died, and Natalia Slobonskaya, 23 of Vienna, Va. lost her left foot in the incident around sunset on Sept. 3, 2001.